The Dutch city of The Hague lies about an hour from Amsterdam. The Hague is a great city for an Amsterdam side trip. By train from Amsterdam Central Station to The Hague, it takes 50 minutes. The Hague is not like Amsterdam. While Amsterdam is the city of the Republicans, has canals and 17th century merchant houses, The Hague is the city of royalty and aristocracy. The streets of The Hague (Den Haag or the fancy ‘s-Gravenhage in Dutch) are spacious, lined with dignified palaces and large 18th century diplomat residences. The Hague feels green and open, with the wind of luxury blowing through its excellent shopping streets. The Hague has a slightly posh inhabitants and a rather boring night life. But The Hague is also a folkish city. ‘The Hagenezen’, the ‘common folk’ have their own culture and speak with a strong accent. Some of the poorest neighbourhoods of The Netherlands are in The Hague. The Hague does have one feature that Amsterdam so tearfully misses: a beach! The Hague is definitely a wonderful destination for a side trip from Amsterdam, with lots of wonderful museums, great shopping and a beach. Ever since the Middle Ages, The Hague has been known for its governmental residences. One of the first rulers of Holland built his castle in 1248 along the water now called Hofvijver (the pond next to the Binnenhof). When the first Dutch republic, the 7 united Dutch provinces, was claimed in 1588, the government chose The Hague as the ruler’s city. During the Golden Age (17th century), these 7 provinces played a large role in national and international politics, drawing diplomats, statesmen and their affluent families to the city. When The Netherlands became a monarchy, The Hague became the city of royalty. The Dutch King Willem-Alexander has his office space in Noordeinde Palace, a stone’s throw from the busy city. The Royal Palace Eikenhorst in nearby Wassenaar is the home of the current King Willem-Alexander and his wife, Queen Máxima. The Hague also hosts some very important international organisations. The most important is the International Court of Justice, housed in the The Hague Peace Palace (Vredespaleis) since 1945. The Court is the highest legal body of the United Nations, settling disputes between countries. In total there are about 130 international organisations that have their seat in The Hague, bringing in a large community of expats and diplomats to the city. Shopping in The Hague, building by Dutch architect Berlage of Amsterdam School. The former colony of Indonesia (Dutch East Indies) left its mark on The Hague. During the Golden Age (17th century), the Dutch trading corporation VOC started doing business with kings and rulers on the many islands of the country now known as Indonesia. From 1816 until the Second World War, the Dutch East Indies were an official colony of The Netherlands. The civil servants who lived and worked in the Dutch East Indies with their families spent many vacations in The Hague. Ever since, the bond between has been strong between The Hague and Indonesia. Many ‘repatriates’, people who moved back to the Netherlands, went on to live in The Hague. You’ll find many street signs and monuments referring to this, (at times rather grim) background of Dutch colonialism. A well known neighbourhood in The Hague is the Archipel neighbourhood, where the streets are named after the islands of the Indonesian archipelago. In this neighbourhood many former colonials took up residence. In 1949, Indonesia became independent. Many Indonesian people moved to The Netherlands. The Hague has the largest Indonesian community in The Netherlands. In summer, the Indonesian community celebrates their roots during the Tong Tong Fair (formerly known as Pasar Malam). This is one of the largest Indonesian cultural and culinary festivals in the world. Amsterdam Side Trip: What to see in The Hague? The Hague centres around the Binnenhof, where the Dutch government is seated. The Binnenhof is Dutch for inner courtyard. 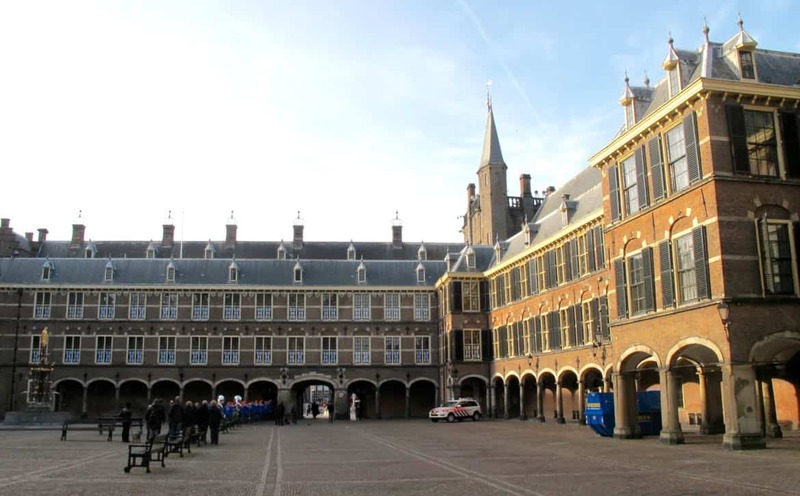 For a long time, the Binnenhof was sealed from the outside world with thick walls. Entrance was only possible through 4 gates. Nowadays, visitors are welcome to roam around the century old buildings around the court. Most spectacular are the Ridderzaal (‘Knight’s Hall). The Treveszaal was built around 1600 to allow for peace talks during the Eighty Year War with Spain. Nowadays, this is where the Dutch Ministers gather every Friday. There is also a chapel, the hofkapel, dating back to 1777. The fountain in the middle dates back to 1885, a design by Pierre Cuypers, the Dutch architect who also designed the Rijksmuseum and Amsterdam Central Station. The Prime Minister of the Netherlands holds office in the Torentje (Little Tower). Next to the little tower is the Mauritshuis, former living quarters of a Dutch count. The Mauritshuis is now a museum with an interesting collection of paintings, many from the period of the Golden age: Vermeer, Rembrandt, Jan Steen and Frans Hals as wells as Dutch and Flemish work from 1400 to 1800. The Mauritshuis Museum is an interesting stop for a side trip from Amsterdam. Panorama Mesdag in The Hague. Panorama Mesdag is a must visit if you decide to do an Amsterdam side trip to The Hague. The museum centers around a enormous panoramic painting. The painting depicts the landscape of the Scheveningen dunes in a cylindrical shape. When you stand in the gallery and look around, you will have the feeling you are walking in the sand dunes of Scheveningen while looking down to the sea, the beach and the village, like it was in the late 19th century. The illusion is made even stronger by the sounds of seagulls and the terrain of sands and shells surrounding the canvas. Visiting a panoramic painting was a popular form of amusement in the 19th century. Typically, landscapes were portrait. In Europe, many panoramas recreated historical events and battles. Few of these panoramas survived. The Panorama Mesdag in The Hague was painted by Hendrik Willem Mesdag in 1880, a Dutch Marin painter. Eventually Mesdag bought the painting, including the location himself, keeping the painting safe from decay, thereby making the Panorama Mesdag the oldest surviving panorama in its original location. Scheveningen, a rather unpronounceable district of The Hague is definitely worth a visit. The seaside resort Scheveningen has a long beach boulevard to stroll or you can take the promenade on the 300 meter long pier. You can stroll to the view deck with an amazing view on the sandy dunes on shore or kilometers on the North Sea. Along the promenade there is also an the indoor shopping arcade and a casino. In summer, Scheveningen beach is long and broad and you can find a empty beach seat at one of the many beach pavilions, bars and restaurants. You can reach Scheveningen beach easily by tram (9,1 or 11) or bus (22). ‘Bond of Union’, 1956 by M.C. Escher. Famous all over the world are the surreal paintings of M.C. Escher and a museum dedicated to this work is found in The Hague. Escher’s paintings portrait impossible, paradoxal situations. The museum displays the originals of Escher’s work, like ‘Belvédère’, ‘Ascending and Descending’, ‘Day and Night’ and parts of the ‘Metamorphosis series’. On the top floor of the museum, there is a more general exhibition about optical illusions. There are also animations and a virtual reality room which makes the Escher Museum also a lot of fun for children. The Escher collection is housed in a former winter palace of Dutch Queen Emma. Cold, rainy and windy? The amazing dome theatre of Omniversum is great for children and adults. The Omniversum is a film theatre where the images are projected through a fish-eye lens on a enormous dome screen. The film takes place around you and above you which makes the film much more impressive. Before, the Omniversum screened films about the universe, the dome taking the positing of the nightly sky. Nowadays, the films are much more about nature. English translation is given by an earphone. Check the website calendar for programming. Civil servants on leave from far away place often stayed in The Hague. One of the most famous hotels was the Hotel Des Indes, a luxury hotel on the Lange Voorhout. The hotel Des Indes was built as a palace for a baron in 1858. It had stables, servant quarters and a grand ballroom. In 1881, after 4 years of renovating, the Hotel Des Indes was opened. It was a hotel with refined taste and elegance where decadent parties and exclusive banquets were held. An interesting anecdote comes from the time of the German occupation. While the German soldiers enjoyed many festive occasions in the Hotel, the management actually hid Jewish people on the top floor (they all survived the war). The hotel Des Indes still exists, it is now part of a hotel chain. The interior of Hotel Des Indes is still fantastic, though it has been renovated in 2006. Definitely stop here for a coffee on your side trip to The Hague, it feels like you go back in time a 100 years. For an Amsterdam side trip The Hague is a good choice.